Fulfil is the World's First Protein & Vitamin Bar! Seriously tasty, this deliciously soft caramel bar with rich peanut chunks contains 9 essential vitamins and 20g of protein - and has all the benefits of being low in sugar and high in fibre! Milk chocolate with fibres and sweeteners 20% (cocoa butter, inulin, oligofructose, cocoa mass, whole milk powder, skimmed milk powder, sweetener (erythritol, steviol glycosides), emulsifier (soy lecithin), flavours), milk protein, caramel flavoured layer 16,4% (bulking agent (polydextrose), palm fat, xylitol, skimmed milk powder, emulsifier (soy lecithin), salt), gelatine hydrolysate, humectant (glycerol), peanuts 5,6%, soy crisps 5,5% (soy protein, tapioca starch, salt), cocoa butter, flavours (contains peanut), low fat cocoa, soy oil, vitamins (vitamin C (ascorbic acid), nicotinamide, vitamin E (tocopheryl acetate), calcium pantothenate, vitamin B2 (riboflavin), vitamin B6 (pyridoxine hydrochloride), vitamin B1 (thiamin hydrochloride), folic acid, vitamin B12 (cyanocobalamine)), salt, sweetener (sucralose), emulsifier (soy lecithin). Excessive consumption can lead to laxative effects. Please note that this product is manufactured in a production facility that is working with a big variety of different raw materials inclusive wheat, gluten, milk, egg, soy, nut, peanut and sesame seed products. 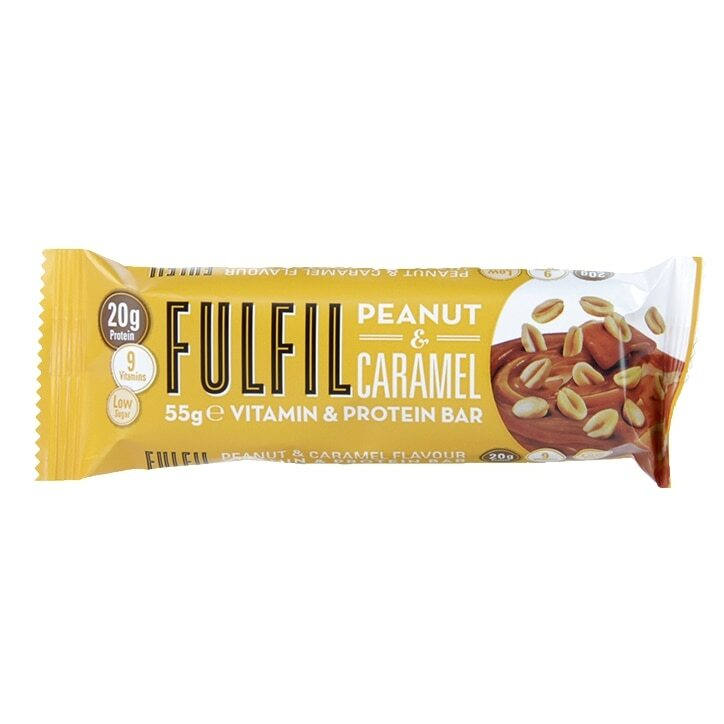 Fulfil Peanut & Caramel Bar is rated 4.9 out of 5 by 9. Rated 5 out of 5 by Admin55 from Very Tasty I have one of these bars after each work out. They are very tasty and not dry like some protein bars. I will certainly purchase them again when my box is nearly empty. Low in sugar which is ideal as I am borderline diabetic. Rated 5 out of 5 by Scanners from Best protein bar ever Love these bars. This one is my favourite with a lovely crunchy texture and amazing peanut taste. Rated 5 out of 5 by FrenchFancies from Great tasting! I bought two of these and it is one of my favourite fufil bars, and tastes great and is lower in calories than other protein bars.